Alternative computing is always an fascinating topic, and the sheer processing power potential for quantum computers makes that field particularly interesting. Quantum computers can solve in a matter of moments problems that would take ordinary computers years to work out. But thus far, these computers exist only as state-of-the-art experimental setups in a few physics laboratories. Now, Elena Kuznetsova, a post-doctoral researcher in UConn’s Department of Physics, has proposed a new type of quantum computer that could bring the technology one step closer to becoming a reality. Via KurzweilAI.net — And if quantum amnesia is a real phenomena without a solution time travel would be a one-way affair. I’m not sure if anyone would sign up for a one=way ticket to an uncertain future. The forward-only direction of time is the result of quantum-mechanical amnesia that erases any trace thattime has moved backwards, says Lorenzo Maccone of MIT. Looks like things are moving that direction. Very cool. Quantum cryptography, a completely secure means of communication, is much closer to being used practically as researchers from and Cambridge University’s Cavendish Laboratory have now developed high speed detectors capable of receiving information with much higher key rates, thereby able to receive more information faster. Published as part of IOP Publishing’s New Journal of Physics‘ Focus Issue on ‘Quantum Cryptography: Theory and Practice’, the journal paper, ‘Practical gigahertz quantum key distribution based on avalanche photodiodes’, details how quantum communication can be made possible without having to use cryogenic cooling and/or complicated optical setups, making it much more likely to become commercially viable soon. One of the first practical applications to emerge from advances in the often baffling study of quantum mechanics, quantum cryptography has become the soon-to-be-reached gold standard in secure communications. Quantum mechanics describes the fundamental nature of matter at the atomic level and offers very intriguing, often counter-intuitive, explanations to help us understand the building blocks that construct the world around us. Quantum cryptography uses the quantum mechanical behaviour of photons, the fundamental particles of light, to enable highly secure transmission of data beyond that achievable by classical encryption. The photons themselves are used to distribute keys that enable access to encrypted information, such as a confidential video file that, say, a bank wishes to keep completely confidential, which can be sent along practical communication lines, made of fibre optics. Quantum indeterminacy, the quantum mechanics dictum which states that measuring an unknown quantum state will change it, means that the key information cannot be accessed by a third party without corrupting it beyond recovery and therefore making the act of hacking futile. While other detectors can offer a key rate close to that reported in this journal paper, the present advance only relies on practical components for high speed photon detection, which has previously required either cryogenic cooling or highly technical optical setups, to make quantum key distribution much more user-friendly. Using an attenuated (weakened) laser as a light source and a compact detector (semiconductor avalanche photodiodes), the researchers have introduced a decoy protocol for guarding against intruder attacks that would confuse with erroneous information all but the sophisticated, compact detector developed by the researchers. Governments, banks and large businesses who fear the leaking of sensitive information will, no doubt, be watching closely. We’re getting closer to harnessing quantum mechanics to create supercomputers and other devices. The brave new world of quantum technology may be a big step closer to reality thanks to a team of University of Calgary researchers that has come up with a unique new way of testing quantum devices to determine their function and accuracy. Their breakthrough is reported in today’s edition of Science Express, the advanced online publication of the prestigious journal Science. Similar to any electronic or mechanical device, building a quantum machine requires a thorough understanding of how each part operates and interacts with other parts if the finished product is going to work properly. In the quantum realm, scientists have been struggling to find ways to accurately determine the properties of individual components as they work towards creating useful quantum systems. The U of C team has come up with a highly-accurate method for analyzing quantum optical processes using standard optical techniques involving lasers and lenses. Move over one-time pad, there’s a new kid on the cryptographic block — quantum cryptography. This is one amazing application for the weirdness that is quantum mechanics and quantum effects. And one cool way to transmit secret messages. Today’s KurzweilAI.net newsletter had a link to a Scientific American story on space-based quantum codes used for cryptography. Over at Bad Astronomy, Phil Plait wrote about this on Monday. He offers a cool short-version explanation of the quantum mechanics involved, and his comment section has even more detail provided by BABlog readers. University of Vienna researchers hope to send an experiment to the International SpaceStation (ISS) by the middle of the next decade that would pave the way for transcontinental transmission of secret messages encoded using quantum entanglement. 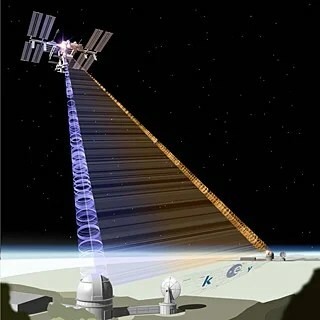 In addition to potential use for secure communications, the “Space-QUEST” project would give researchers a chance to test the theory that entanglement should be unlimited in range. Researchers hope to send an experiment to the International Space Station (ISS) by the middle of the next decade that would pave the way for transcontinental transmission of secret messages encoded using the mysterious quantum property of entanglement. So some European scientists came up with the idea of using the International Space Station (I know! Using ISS for science! Wow!) to test this out. They can create a small setup with a laser which can create entangled photons. The entangled photons are then sent simultaneously to two different ground stations, widely separated on the surface of the Earth, so that both have a copy of the entangled photons. In addition, two quantum keys are created based on the photons; this is essentially a code based on the state of the photons — like winning a bet is based on which way a coin lands. The two keys are different, and one each is sent to the two ground stations. So both stations have a pair of entangled photons (identical to the other station’s) and a different key. Each key is actually a long chain of 1s and 0s. The two keys are then compared on the ISS to create what’s called a bitwise XOR — for example, if two coins both land heads then the XOR operation yields a 0, but if they land differently (one heads and one tails) then it yields a 1 — it’s just telling you whether they are the same or different. So for each place in the key, the two numbers are compared, and if they’re the same (both 1s or both 0s) then a 0 is written down. If they are different then a 1 is put there. When this is done, you get a third string of 1s and 0s, representing a comparison of the two keys. Still with me? Yeah, me neither, but we’re almost done. So now the ISS has this long number string which represents whether the keys are alike or different. It then transmits this to one of the two stations on Earth. So? What does this mean? This means that now the two ground stations can create a code between them based on their keys, a code that is known only to them and no one else. Furthermore, this code cannot be cracked by anyone, anywhere, because it’s based on entangled photons that cannot be known to anyone else! Because of entanglement, they know what the other station has because they can look at their key and figure it out. But no one else can.